The Indy 500 is over but racing season is just revving up in Indianapolis! 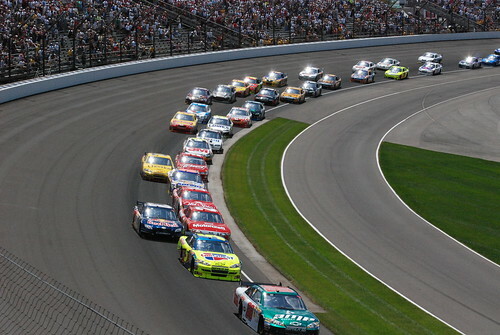 This weekend, July 25, the Indianapolis Motor Speedway will host the Brickyard 400 as part of NASCAR’s 2010 Sprint Cup Series. In honor of the speedway’s 100th birthday, general admission tickets are only $40 and children 12 and under can attend for free! At that price, you can take the whole family for a day at the races. Experience 160 laps of heart-pounding excitement as you watch the best drivers in the business compete for the trophy. Kevin Harvick, Jeff Gordon, Jimmie Johnson and Tony Stewart will all be there, as will hundreds of thousands of passionate fans. If you’re thinking about attending the Kroger 200 on July 24 at O’Reilly Raceway Park, check out the Two Track Double Pack – $75 for 1 Brickyard 400 reserved seating, 1 Kroger 200 reserved seating, a food voucher for IMS and ORP and transportation to and from the races. The Two Track Triple Pack for $95 will include a ticket to the AAA Insurance 200 on July 23. But hurry, you only have until July 21 to take advantage of these fantastic offers for a weekend at the races! Festivities will be taking place at the Indianapolis Motor Speedway all weekend including concerts, Q&A with several drivers, qualification races and autograph sessions. Get in the racing spirit this weekend! View a complete Brickyard 400 schedule.